As an alternative this Christmas why not make this crumbly textured layered cake. Serve warm for a festive dessert with whipped cream, brandy butter or créme fraîche or serve it cold at tea time, dusted with icing sugar. Place the flour, butter, sugar, honey and cinnamon in a food processor and blend until the mixture resembles fine breadcrumbs. Tip half the mixture into a 23cm spring-release cake tin and press down gently. 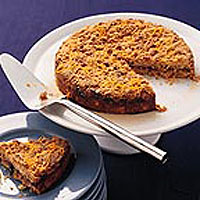 Spread the mincemeat on top and sprinkle the remaining crumble mixture over the top. Bake in a preheated oven 190ºC, gas mark 5 for 30-35 minutes or until golden and cooked through. Allow to cool slightly, decorate with orange zest, then transfer to a serving plate. As time is short at such a busy time of the year it is useful to know that this recipe can be prepared in advance and frozen until required. For best results after freezing defrost thoroughly and serve warm rather than cold. Place in a preheated oven 180C, gas mark 4 for 10 minutes. As an alternative to cinnamon, add the finely grated rind of an orange or two satsumas.